To make the best decisions for an organization, executives need the most up to date information in an easily understandable format. The challenge for dashboard designers is not just about finding the right information, but delivering it to executives in an actionable way. Constantly playing around with new charts can lead to new insights, but this can be time consuming. However, there are 5 charts which you can rely on to find opportunities from virtually any data. You can set these charts on a dashboard once, and then constantly refer back to them for useful information without having to change your dashboard, making them maintenance-free. This article will show you what these charts are, and what they can do for your decision making. When measuring and managing your KPIs, a great way to get useful information from them is to track the changes in the value of the KPI over time (e.g. 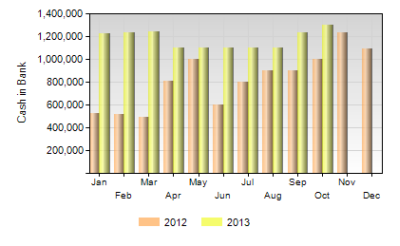 number of sales each month). The column chart is one of the most basic charts for comparing values over time, but its simplicity is what makes it one of the most effective. By comparing each column to the previous ones, you can see how your KPI values have changed, and whether you should tweak the processes in your business to improve this performance. Column charts work better than simple data tables because they do not need to be read to communicate a company’s KPIs; it’s easy to glance at the columns and gauge the differences in value over time. By implementing a column chart in your management dashboard, you can always get useful, actionable information without going through many different charts. As long as you have a dashboard system that automatically updates charts as you enter new data, you will always have an idea of what is going on. 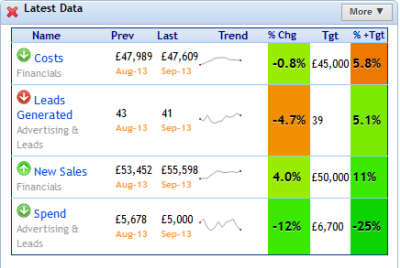 Couple with the charts below, column charts go a long way towards giving you a maintenance free dashboard. Another simple but very effective chart,line charts show managers the overall trend in their KPI data, not specific values. 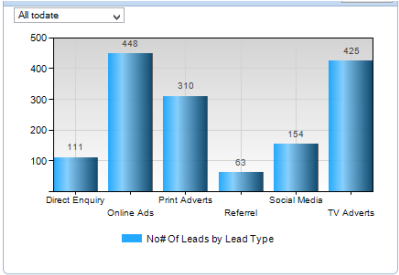 While a line chart and column chart made from the same data show the same information (values displayed over time) the line chart joins each point in the chart so that you can follow the progression of the KPI through time. Arguably, a line chart is even more useful than a column chart because it lets you easily spot sudden rises and dips in values, allowing you to pinpoint what happened when these changes occurred, and why. A line chart can be applied to any data over time, and can always be used to spot trends and take action immediately. Therefore, this chart forms the backbone of any dashboard. A comparison chart can take many different forms, so it isn’t a different kind of data visualisation to column and line charts per se. 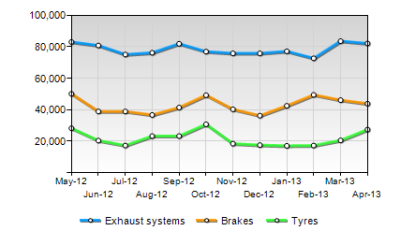 The main difference is the way it uses visualisations to compare KPI values at the same times in different years. Usually, a column or line chart displays a visualisation along one plane, so you get one row of columns or one continuous line, grouping values which occur at the same time each year. For example, a column comparison chart groups the columns for each month in different years. A line comparison chart shows a different line for each year of data on top of each other, letting you see how each compares while observing overall trends. Comparison charts offer a different perspective on your data from regular column and line charts, giving managers the ability to look back at historical data to predict what will happen in the future, or simply compare performance between years.You can learn more about how best to use comparison charts in our best practice guide for creating dashboard reports. Category charts provide a totally different function to our previous three charts, as they show how your data is made up, rather than its performance over time. There are many kinds of category charts, and most people will know what a pie chart is even if they don’t know what it’s for. 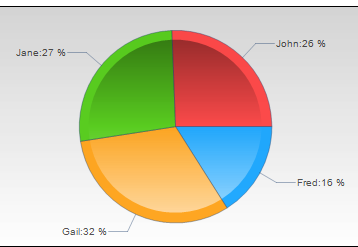 However, the main problem with a pie chart is that is only useful for showing the relationship between a part and its whole, as each “slice” of a pie chart is very difficult to visually compare to other slices. 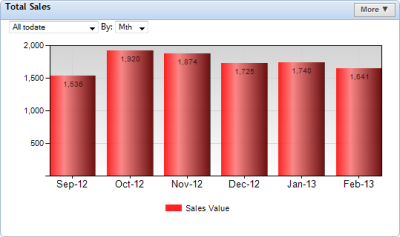 Therefore, I recommend a column chart for displaying your categories, as it is much easier to compare them. For example, if your sales data is made up of values from different salespeople, a category chart compares the sales for every sales person over a given time period (e.g. this year). While not as powerful as a time based chart, they let you compare the different parts of a KPI so that you can see if there are areas you can improve in. You might monitor product popularity in different countries, or which forms of advertising your sales leads are coming from. The purpose of colour-coded charts is simple; it gives managers an immediate visualisation of what’s happening right now. Usually, colours are linked to your target values for your KPIs, and will change to red or green depending on whether you’ve met, exceed or failed your target for a given time period (e.g. a month). There are several great ways you can use colour coded charts to tell you what needs to happen immediately. 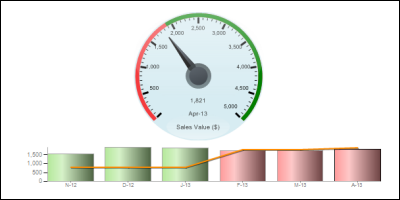 One of the most popular is gauges, which point to a different colour depending on your KPI’s immediate status. However, what we recommend is a scorecard, which provides lots of colour coded information to give you an immediate view of your KPIs in the past and present, at a glance. With these charts, you can create a dashboard which you rely on to deliver actionable information at a glance, maintenance-free. I encourage you to try out these tips yourself in your free Target Dashboard trial. If you have any questions, feel free to drop me an email.